Speakers sound best when theyre in enclosures. The result is richer mid-range and stronger, deeper bass. These Dash-Pods utilize the available space in every 03-06 TJ Wrangler and will hold 5.25 speakers. If you have the 7-speaker Infinity® system that was offered beginning in 2002, you can improve on the 4 dash components and replace them with Dash-Pods holding larger speakers. 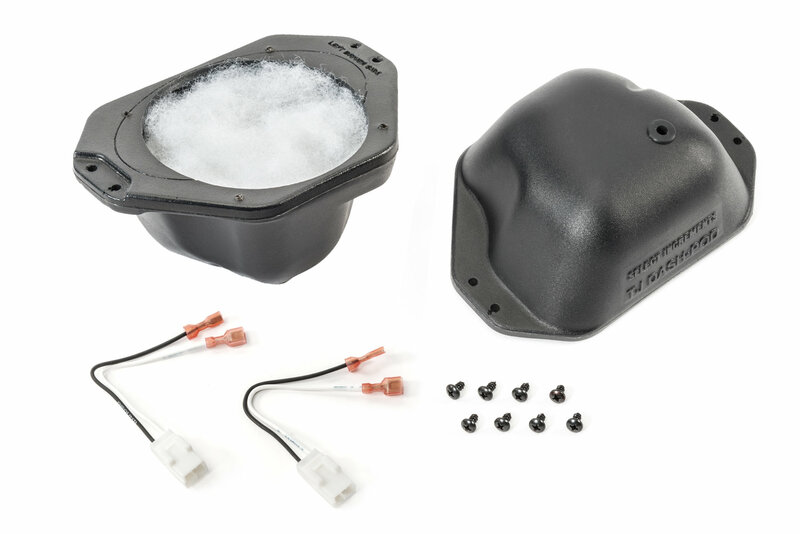 All Dash-Pods include direct-connect plugs that fit your Jeeps factory wiring. No cutting or splicing wires, no soldering, just plugem in and youre done! Pre-cut speaker holes are standard for every pair of Dash-Pods, you simply pick which version you want. We offer the pods empty so you can add your own favorite speakers, and we also offer them loaded with Kicker® speakers. Poly-fill, install-specific speaker mounting screws, and detailed instructions are included. Installation is a breeze and, in many cases, takes only a few minutes with a screwdriver. Picked up these speaker pods for my 06 rubicon to replace the stock 4 inch speakers. I filled them with focal 5 1/4 icu 130. I left the polly fill in them, and used foam tape to seal the speaker to the pods. The foam seal that comes with the focal speaker nearly fits but will work if you are patient. I filled the rear speaker pods with focal rcx 130s. I'm pushing them with a 5 channel ml audio sub with a 10 inch hp audio sub in a custom built ported enclosure that was built by Audiotistics in victorville ca. The sound quality is unbelievable and the mid bass is extremely strong, witch I think is a direct result of the select instraments enclosure. Everything fit together perfictly. Truly added some depth and clarity to my new front dash Kicker 5.25 speaks for my 12 year old Jeep TJ. Sounds like new!